The founder of A. Blank was Abraham Blank (1875-1932), an immigrant from Romania. The claim "Established 1899" would seem to be a bit early for this business. The first listing in New York city directories was in 1908 at 82 Broad St. and in the New York telephone directory in 1910 at 73 Broad St. The telephone directory continued to list them at 73 Broad St. through 1928. Abraham Blank seems to have immigrated to the U. S. approximately 1901. He is recorded in the 1905 New York State Census, age 27, living at 169 Allen St., Manhattan. His place of birth was Romania, and his years in the U. S. were four. Also, his occupation at the time was recorded as "Garment Work." In the 1910 U.S. Census Abe Blank was 29, born Romania, immigrated 1901, and his occupation was "Carpenter Shop." His death notice, New York Times, 28 Dec. 1932, pg. 17, read simply, "Blank - Abraham, beloved husband of Mollie. Funeral service at Flatbush Memorial Chapel, 1,283 Coney Island Av., Brooklyn, Wednesday, 3 P. M. Interment Washington Cemetery." 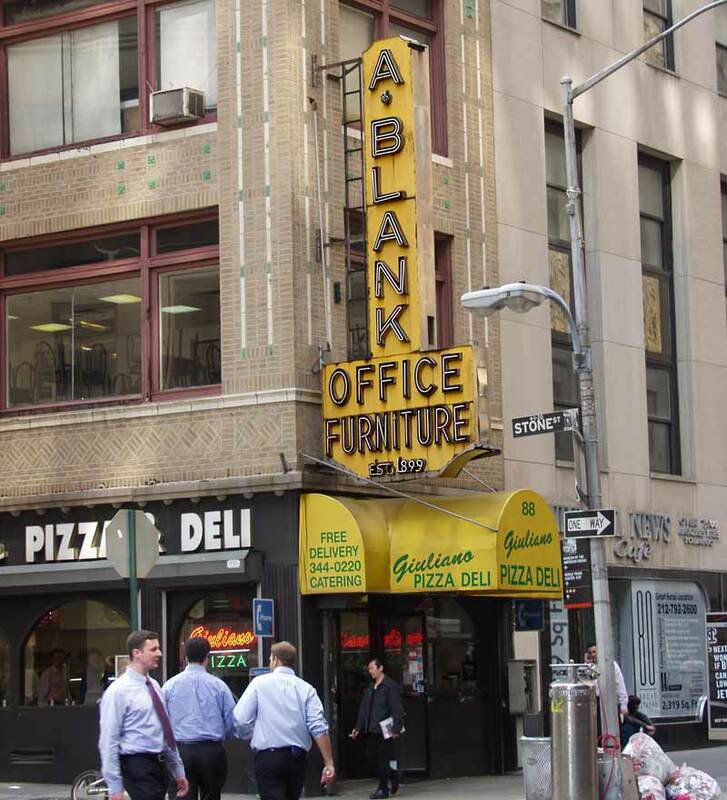 This ad for A. Blank dates from 1954 when Blank was located nearby at 74 Broad St. with a branch office at 7 E. 46th St. in midtown. This later ad for A. Blank dates from 1958. Now they were located at the address above, 88 Broad St. The telephone number remains BO 9-8884. Both ads indicate A. Blank had additional offices in Miami and Los Angeles. The business was located in downtown New York in the area of Broad St., Stone St. and South William St. from 1908 until the early 1990s. They were located at 88 Broad St. from 1958 until they closed. Among Abraham Blank's sons who continued the business after his death were Harry Blank (1908-1962), Louis Blank (1909-1958), and Isaac Blank (1911-2005). Louis Blank received the following obituary notice in the New York Times, 21 Aug. 1958, pg. 25, "Louis Blank, president of A. Blank, Inc., office furniture concern, died of a heart attack yesterday while vacationing at Provincetown, Mass. His age was 48. Mr. Blank lived at the Parc Vendome apartments, 350 West Fifty-seventh Street. The business has stores in lower Manhattan, Los Angeles and Miami, Fla. Mr. Blank also founded a television furnishings branch, and had been active in real estate in the Wall Street area. He leaves his wife, Marian; five brothers, Jacob, Harry, Isaac, Harvey and Larry, and two sisters, Mrs. Jean Meth and Mrs. Lillian Solomon."